Who could have possibly seen this shocking Survivor tribe swap coming? 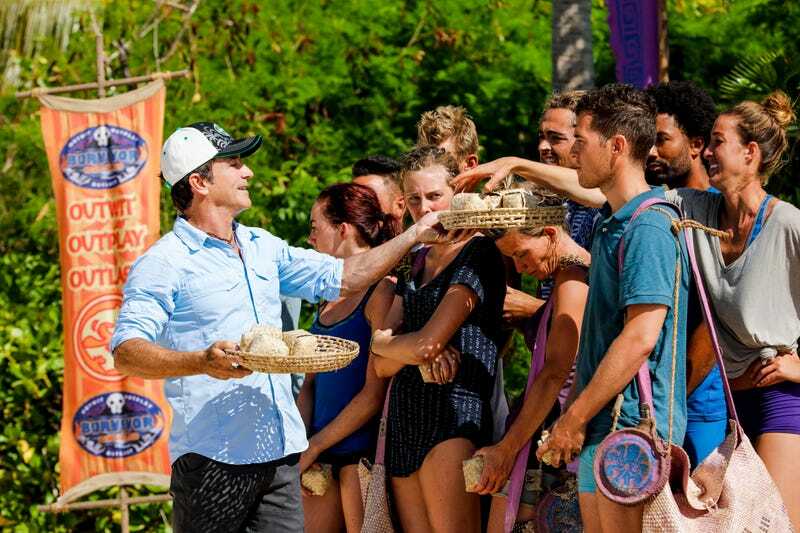 Probst has a big surprise for the castaways! “Drop your buffs!” The players are good sports and pretend to be shocked by this development, but come on. They knew this was going to happen. It always happens. They talked about it last week! And since CBS has been promoting the swap all week...who exactly is supposed to be surprised here? The only surprise for me is that they aren’t divided into three tribes of six, which would be more interesting than what actually transpires: old Naviti now outnumber old Mololo five to four on both new tribes. The problem with this from a storytelling standpoint is that we really didn’t get to know some of these people at all last week and it’s not clear what all of the tribe dynamics were prior to this twist. What we do know is that Dom and Chris have it in for each other, and sure enough they’re both trying to shore up support with the old Malolo members in order to take the other out. Morgan is with Dom, and she and Libby hit it off. Angela is with Chris, but she’s not entirely sold on his plan. The old Naviti members on Malolo aren’t thrilled with their new digs. Bradley in particular is surprised to learn there’s dirt on Survivor. The remaining original Malolo members know they’re screwed, so the idol search is on. Michael find one of the two idols James was holding when he was voted out in China. Ghost Island is really useless so far, isn’t it? Two artifacts have now been found without its help. Malolo builds a lead in the immunity challenge, then falls behind when they can’t figure out how ladders work. It all comes down to the puzzle anyway, and Malolo breezes through it. It’s time to send someone to Ghost Island, but since Malolo can’t come to a unanimous decision, Naviti draws rocks. And here it gets interesting, because Chris draws the white rock, meaning the numbers are now even between the original tribe members for tonight’s vote. There’s nothing for Chris at Ghost Island except a bit of a breakdown now that he’s alone and thinking of his mother with MS back home. Ghost Island is a place of sadness. Angela is willing to go to rocks in order to stay loyal to old Naviti, but Wendell isn’t having it. He sees her as Chris’s right hand and wants her out. Dom tries to gain trust with old Malolo by exposing his fake idol, but it has the opposite effect. James wants to target Morgan, but Libby isn’t down with that. Amazingly, no one from old Malolo is targeted at any point. At Tribal Council, the initial chatter is that the two tribes are still split down the middle, but that ruse quickly crumbles. Morgan is suddenly getting a lot of screen time, going on about how only time will tell whether they’re all great actors or telling the truth. When Probst starts reading the votes, it looks like a landslide against Angela...until suddenly Morgan’s name comes up. And again. And a couple more times until her torch is snuffed. It’s a great move for the old Malolo because not only have they knocked out a Naviti power player, they’ve revealed that Dom and Wendell were willing to cut Angela. Nicely done. Dom gets the legacy advantage, which certainly does seem to be cursed.